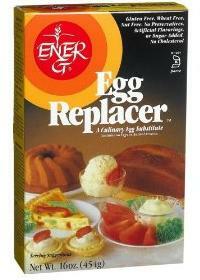 Sometimes, when a recipe does not include eggs, it will call for “egg replacer” instead. This is most often found in vegan recipes, since vegan recipes don’t include animal products and never use eggs, although a search for egg-free bloggers will find you plenty of people who also don’t want to include eggs in their cooking. Egg replacer is a packaged product that is a dry mixture of starches and/or binding ingredients that is meant to replace some of the function of an egg in a recipe. They include ingredients like cornstarch, potato starch, soy powder and flax seed, just to name a few. Some mixtures will contain a small amount of leavening or xanthan gum, as a binder. Egg replacer doesn’t replace eggs in all circumstances, so you wouldn’t want to make an omelette out of it, but the replacers do work well in baked goods. In baked goods, eggs usually add some moisture and some thickening and binding power to a recipe, particularly in recipes were only one or two eggs is called for. Egg replacers that are a combination of starch and water – starch for thickening and water for moisture – can mimic the function well enough that your chocolate chip cookies will still taste very good when they come out of the oven. I’ve seen suggestions to use 1/4 cup applesauce, mashed banana or other fruit purees, but these don’t have the same effect as the starch and flaxseed mixtures and can potentially make your batter a little bit too thick or heavy. This little post is an important one. I get questions on how to replace eggs in baking on a semi-regular basis. I’ll just point people your way. Argh, why did I spend $6.00 on a box of egg replacers when I could have just used cornstarch? Thanks for the tip! I’ll have to try the cornstarch egg replacement in the vegan, wheat free, Urth copycat cookies. Thanks – the homemade substitutions really help. I’m a vegan baker who regularly reads your blog. I have my second cookbook on vegan baking coming out in a couple of months. On my site under “vegan baking?” I have a whole section on egg replacers. My book also has an entire section on the chemistry of baking and how to best replicate the chemistry in vegan baking. I think this may be the first time I’ve commented on your blog, although I’ve been reading for 3 years. Hi! I love eggs,its a part of my breakfast.thanks for giving this interesting information. I read your article and i got many information.i hope you will write again useful article. Thanks for great links with nice tips that will be helpful to me thanks again. I agree with a previous poster. Just use cornstarch. This looks really disgusting. Has any of you tried this with honey? It tastes very good with eggs. Does using egg replacer in a regular recipe change the baking time? My eggless cake recipes bake for 25 minutes but my egged cake recipes bake for 45. Any ideas? Thank you, but am awfully confused.. sorry for the STUPID question, but i assume it is any of these… right…or is it all of these mixed together….? Hari – It is any of those combinations. How do cookies turn out when one uses the cornstarch slurry as an egg replacer in the dough? Do the cookies spread more? Get crispier? End up pasty? I hope you can help me out with this one. Thanks. There isn’t one answer to your question. Different cookie recipes will turn out slightly different ways. Often the cookies will spread a bit less than they do with an egg, but typically they turn out to be very similar. Some recipes may require a bit of experimentation if they rely a lot on the egg for their texture (such as very cakey cookies or cookies that use only egg whites).